* This is my article in BusinessWorld on July 27, 2017. Aside from frequently cussing and cursing or threatening people with state-sponsored murders over his anti-drugs war, President Rodrigo R. Duterte (PRRD) is not exactly known for articulating policies on industrialization. But during the State of the Nation Address (SONA) this year, he was able to coherently explain his dreams for the country. “That is why I say that it is not enough that we mine this wealth. What is more important is that we convert the raw material thereof into finished products for international and local purposes. That way, it will not only be the few who are the rich but also the poor who are many who will benefit therefrom. This is an understandable concern and aspiration. And this has been articulated by many other previous administrations and Presidents in the past. For instance, former President Fidel V. Ramos articulated it partly at the Mining Act of 1995. Former President Gloria Arroyo articulated it in Executive Order (EO) 270 in January 2004. Is the Philippines ready now to undertake this mining-to-industrialization quickly? In December 2010, the Philippine Institute for Development Studies (PIDS) produced a paper by Dr. Danilo C. Israel, “National Industrialization in Philippine Mining: Review and Suggestions,” PIDS Discussion Paper Series No. 2010-35 (Revised). What are the stages of supply chain from mineral extraction to finished products? In one illustration, Dr. Israel identified these nine stages. (1) Exploration stage, locating the ore to be mined, (2) Development stage, preparation of the mining project before (3) actual Mining and extraction of the ore, (4) Milling and concentration stage, the separation of the desirable minerals in the ore from the undesirable contents, (5) Marketing and transportation, shipping and selling of the desirable minerals to buyers or users, (6) Smelting, the treatment of the desirable minerals to produce impure metal, (7) Refining the impure metal and afterwards built into metal structures by cutting, bending, and assembling, technically referred to as the (8) Semi-fabrication and (9) Fabrication stages. The country is currently engaged in stages (1) to (5), perhaps up to (6), depending on the metallic products. So the challenge is to find investors, local and foreign who can do stages (6) to (9). And it will not be easy to attract these large investors who need large requirements before they bring in their money and technologies. Dr. Israel said that there should be a “comparative advantage” for the country to make this possible. This advantage includes the following: (a) location of mineral deposits to be processed; (b) relative factor costs and input prices; (c) availability of processing technology, (d) distance from major markets and the associated transport costs, and (e) the security of supply. He cited Glance et al. (1992) who said that factors that affect the costs of a prospective processing location and activities are: (a) the cost of meeting environmental regulation which can vary from site to site of operations, (b) market for by products as the profitability of smelting and refining often depends on the ability of processors to sell by-products, and (c) government intervention, which can directly or indirectly distort investment decisions and trade flows. The last item, government intervention, is very important. Interventions can span from A to Z, from where to explore and mine and where not, how to do it, how much payments in taxes, fees, permits, bonds, mandatory funds and contributions, both local and national. Seemingly not mentioned in Dr. Israel’s paper is the role of electricity -- cheap, stable supply of electricity that is available 24/7. Intermittent energy like wind-solar will be a disincentive for mining-to-industrialization development because they are heavily dependent on the weather, not on consumer demand. Plenty of big and reliable base-load plants from coal power have been installed in recent years. This means 24/7 of cheap, stable electricity is assured now and the medium-term. The industrialization dream has been restated and the energy infrastructure has been set up. What the President should assure now is the rule of law, stability of policies, that there will be no more Gina Lopez type of government officials whose happiness rests on how many mining companies he/she has suspended and/or closed. 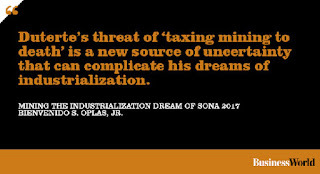 His threat of “tax mining to death” during the SONA is a new source of uncertainty that can complicate his dreams of industrialization. The philosophy of universal basic income (UBI) is floated and discussed in many countries now including the Philippines. The philosophy is lousy because even the lazy or irrelevant-thinking people will have guaranteed universal income. I am reposting a good article by a friend, Nick Sallnow-Smith, Chairman of The Lion Rock Institute (LRI) in Hong Kong. This was published in the LRI Newsletter, June 2017. It is often suggested by those skeptical about the value of free markets, that to contribute to the community you need to be active in the world of charities, NGOs, or what is called “public service”. By implication, to work in the business sector is an indication of selfishness and greed. You are only out for yourself is the implied slur. This approach finds the idea of Universal Basic Income (UBI) very attractive because it is claimed it enables the detachment of the income you receive from the work you do. The promoters of this idea seem to find it self evident that this a “good thing” because people will be spared the drudgery of work and can instead follow their dreams to be creative, or make other life choices unconstrained by the need to earn income. Let’s examine if either of the elements of this argument make sense: that working in business is selfish, and that detaching income from what you do with your life is inherently desirable. The growth in our standard of living since most human beings were engaged in subsistence farming is largely due to the division of labour; to specialisation in activities in which you are relatively more able than others. For this specialisation to be facilitated, we need a means to exchange our skills with the products and services produced by others. This means is money (whether gold, fiat money, shells and any other accepted exchange medium). Money does more than enable us to exchange with others, it provides a measuring device by which we can assess the cost of products and services against their relative value to us. But more than that, the market enables us to assess the relative value to others of the skills we have. When I choose whether to be an artist or a banker or a tour guide, I know my own preferences for what I’d like to spend my time doing. The income I am offered by potential customers of my art, banking skills or tour guide work tells me the relative assessment by others of my prowess in these areas. I may still choose to be an artist, and settle for a low income if I love it enough, but market pricing tells me that the community would prefer me to stick to being a tour guide and not bother with my rather poor oil painting. By pricing my skills in a free market, my value to the community – what I am worth – is laid bare. By contrast, if I work in a charity, NGO, or the public sector generally, there is no test of the value of what I do; certainly not one that enables relative value to be assessed. I might be a rather poor schoolmaster (actually in 1974 I was!) but since the students’ parents did not pay my wages, had no way to dispense with my services, and had no input into the process by which their children were taught, I had no information about whether what I did was valued at the level of my income, nor whether I would be contributing more to society as a barman. Which is more selfish then? 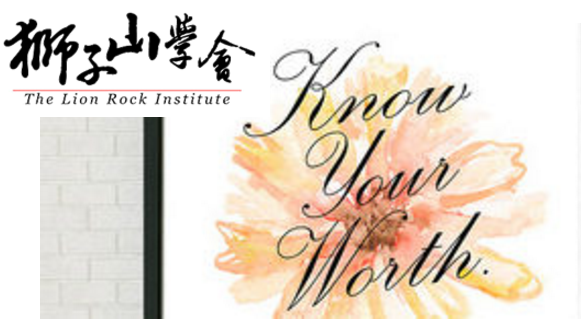 To offer your services in a competitive labour market and see how the community truly values what you do; or to take a position in those sectors which never submit you to a market test. It is concerning to me that those who work in “public service” frequently imply that theirs is a more noble calling than the down and dirty private sector, where everyone is in it “only for the money”. In fact, the opposite is the case. Only if you subject yourself to the market test can you ever know whether the community of which you are a part, values what you do. Let me turn now to the UBI idea, which is currently such a hot topic in policy debates about how to respond the feared loss of jobs resulting from AI. If what you do is detached from the income you receive, you sever completely any possibility of knowing whether what you do is of any value to the community. Indeed the policy proponents are claiming this severance is a benefit, that what we do should have no relationship to what others value in us. We should all be supported by the state so that we can do whatever we like, without regard to its value to society. This seems to me to be a policy of institutionalising the disregard of our value to the community. In answer to the question in my title, it does not matter what you are worth, say the proponents of UBI, it need never be measured. Many who disapprove of free market libertarianism claim it “atomises” the community, rendering us all completely separate uncaring individuals, alone in the social universe. Yet the opposite is the truth. Selling your skills in the market means you are taking account of what others value in what you do, while UBI is the truly “atomising” policy. There is one last aspect of this which I believe to be of even more importance; the “self-worth” that any of us feels every day as a result of what we do. If others have valued what you do (apart from your own satisfaction in a job well done), you feel good. This is deeply important for the way communities are bound together. Not only have you found a way of selling your skills that gives you an income but you have done so in a way that is evidently valued by others. The baker whose cakes are wildly popular is not only happy to be paid for his efforts, his can and does take pride in being valued by his customers. If the future consists of millions of people detached from the feeling that what they did that day was valued, I fear there will be a serious deterioration in self worth and self reliance; the stuff of many apocalyptic sci-fi movies. Of course proponents of UBI will argue that it will meet only “basic” requirements (let’s see how the demands for it to be increased are resisted before we are confident about that). But the drive to find the best use of your skills for the community at large will still have been significantly eroded. You will be paid to be useless, not useful. It is suggested by common sense as well as economic theory that if you subsidise something you will get more of it. Communities should be very careful before they embark on large scale subsidisation of uselessness. * This is my article in BusinessWorld on July 21, 2017. In a presentation during the Asia Pacific Pathways to Progress Foundation, Inc. (APPFI) round table discussion on China Belt and Road Initiative (BRI) last July 11 at Astoria Plaza, Ortigas, APPFI president Dr. Aileen Baviera said that BRI is China’s new international development strategy. It will link China to the larger Asian region, Europe, and Africa through connectivity of policy coordination, facilities/infrastructure, trade/markets, finance (investments, loans, grants, AIIB), and people. The Silk Road Economic Belt will span China, Central Asia, Russia, Europe while the 21st century Maritime Silk Road will span eastern China, South China Sea, Indian Ocean, Mediterranean, North Africa, Europe) + SCS-South Pacific and China-Europe via Arctic, covering 65 countries, 3 international organizations, 4.4 billion people and $21 trillion of trade. Why is China doing this? Aileen said there are three main reasons. (1) Economic -- put excess local production capacity and funds to profitable use, help develop Western China, and access to markets and resources. (2) Political -- shore up domestic support for Xi (amid anti-corruption drive ad slowing economy), build platform for China to take leadership in the provision of global public goods, counter the China Threat Theory. (3) Strategic -- avoid Malacca dilemma, make the South China Sea irrelevant in developing transport and trading links in the region, access to ports and airports reduces need for overseas air and naval bases, and compete with the US influence and perceived containment efforts against China. This is incisive analysis from a local scholar. She also showed maps of the Silk Road Beltway, the Maritime Road covering the three continents of Asia, Europe and Africa, and the Pan-Asia railway network. In many discussions on China’s BRI, often left out is China’s energy agenda that spans practically the same continents and countries. Here are just three of several reports on this aspect. (1) From NY Times, July 1: “When China halted plans for more than 100 new coal-fired power plants this year… China’s energy companies will make up nearly half of the new coal generation expected to go online in the next decade. Europe’s problem is that they are committing sort of energy mini-suicide by relying more on intermittent wind-solar and closing down many of their reliable and big nuclear and coal power plants. So here comes China with huge domestic coal supply capacity plus additional coal plants in countries along the BRI route. 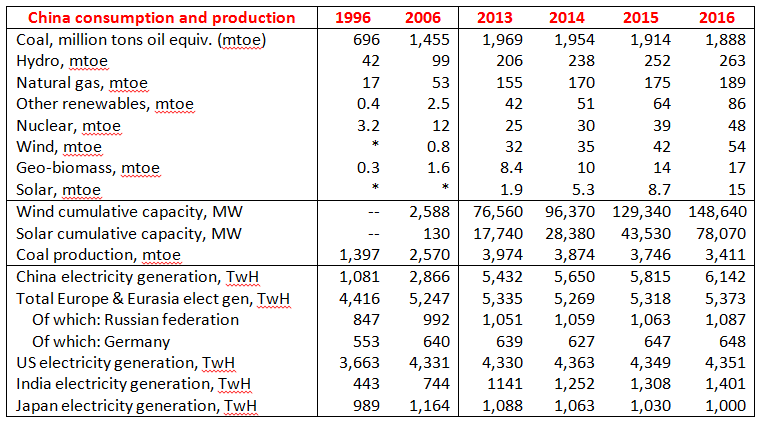 It will have the capacity to augment Europe’s energy needs via those UHV transmission lines and power sources are several thousand kilometers away (see table). 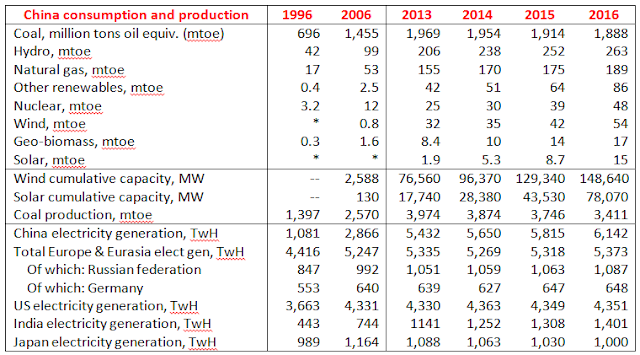 Notice the huge discrepancy between installed capacity of wind-solar and China, and the very small actual electricity output from them. In a forum on “The Framework Code of Conduct, One Year After Arbitration” organized by Stratbase-Albert del Rosario Institute (ADRi) last July 12 at the Manila Polo Club, among the speakers were Roilo A. Golez, former National Security adviser; Antonio T. Carpio, senior associate Justice, Supreme Court of the Philippines, and Dr. Jay Batongbacal, director of UP Institute for Maritime Affairs and Law of the Sea. Justice Carpio highlighted the energy aspect of China’s occupation of shoals and creation of artificial islands in the South China Sea or West Philippine Sea, and the huge implication for the Philippines if China will occupy areas near Malampaya, currently the source of about 3,000 MW of natural gas plants based in Batangas. Malampaya natural gas is expected to be exhausted around 2024 or less than a decade from now. We shall have massive, daily blackouts for many hours daily if no new gas is discovered or new gas facility is created. China has a different agenda in its massive BRI project, some are useful, some are harmful to their partner countries. The Philippines should craft foreign affairs and energy policies that will secure the country’s economic needs, not China’s needs. The Democratic Republic of Congo (DRC) is among the poorest countries in Africa and the world. But it "is the world’s biggest (cobalt) producer, with 60 per cent of the planet’s reserves. The cobalt is mined by unregulated labour and transported to Asia where battery manufacturers use it to make their products lighter, longer-lasting and rechargeable. The planned switch to clean energy vehicles has led to an extraordinary surge in demand. While a smartphone battery uses no more than 10 grams of refined cobalt, an electric car needs 15kg (33lb)." "The worldwide rush to bring millions of electric vehicles on to our roads has handed a big advantage to those giant car-makers which saw this bonanza coming and invested in developing battery-powered vehicles, among them General Motors, Renault-Nissan, Tesla, BMW and Fiat-Chrysler." "Assuming electric car ownership becomes widespread, the amount of cobalt used in car batteries (which typically weigh 100s of kilograms) will utterly dwarf the amount of cobalt used in laptop and mobile batteries. A surge in demand for electric cars would create tremendous financial incentives DRC mining companies to increase production." "This report is the first comprehensive account of how cobalt enters the supply chain of many of the world’s leading brands." "When too much cobalt is taken into your body, however, harmful health effects can occur. Workers who breathed air containing 0.038 mg cobalt/m3 (about 100,000 times the concentration normally found in ambient air) for 6 hours had trouble breathing. Serious effects on the lungs, including asthma, pneumonia, and wheezing, have been found in people exposed to 0.005 mg cobalt/m3 while working with hard metal, a cobalt-tungsten carbide alloy. People exposed to 0.007 mg cobalt/m3 at work have also developed allergies to cobalt that resulted in asthma and skin rashes." "Problems can creep in when these batteries are disposed of. Scientists, in a new study in ACS’ journal Chemistry of Materials, are reporting that compounds increasingly used in lithium-ion batteries are toxic to a type of soil-dwelling bacteria that plays an important environmental role. When I posted those news links in my fb wall, a friend who is a fan and owner of an e-car in the US quickly attacked the Koch Brothers for funding these news reports. I reminded him to stick to the issue -- huge need for cobalt mining worldwide, cheaper cobalt batteries so that their expensive and fanciful e-cars can become more "affordable." Without mentioning the Koch brothers, Trump, Spiderman or any other personalities they dislike, they should stick to the issue. Prove that large-scale cobalt mining especially from DRC is good to help "save the planet." 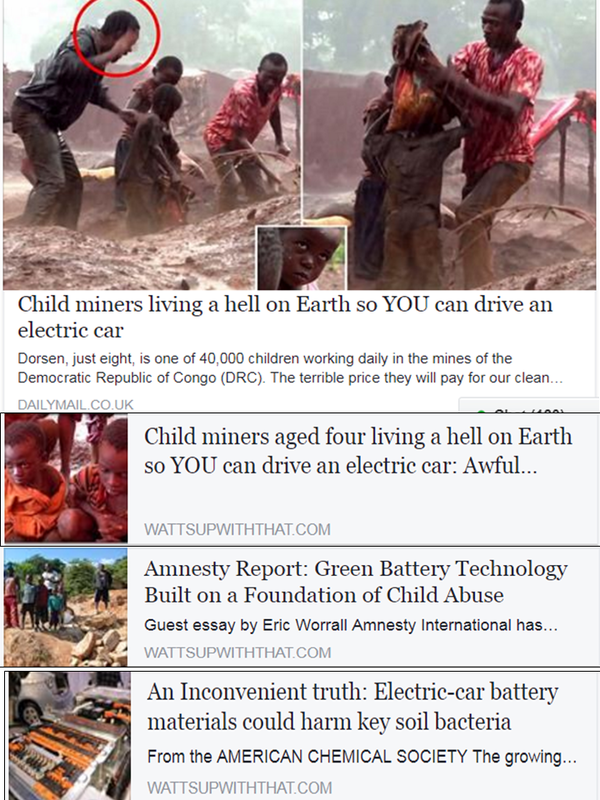 Even Amnesty Intl., among the believers of "save the planet" mantra has already spoken about the evils of large-scale cobalt mining in Congo. About Tesla e-cars. On average they get $7,500/car subsidy from US taxpayers, to make expensive e-cars become "affordable". The cheapest Tesla car I think costs about $34k (about P1.7M), already "discounted" with US taxpayers' subsidy. Governments should step out picking winners and pampering them with lavish subsidies at the expense of taxpayers. Anti-mining "planet saviour" groups and individuals will likely remain silent about this anomaly; worse, they may even defend such type of mining because it conforms with their political and environmental biases. * This is my article in BusinessWorld on July 18, 2017. Through my noninterference, men spontaneously increase their wealth. The “restrictions and limitations” that Lao Tzu mentioned are now what we call regulations, permits, licenses and taxes. The “bandits and crooks” that he mentioned are now the various officials and bureaucrats in government, elected or appointed. While the “noninterference” that he mentioned refers to a minimal and limited government that intervenes and taxes the least. And talking about taxes, especially Dutertenomics’ TRAIN, the numbers below should be a good reminder that it is largely a train for more government coercion and interventions. A short definition of these concepts: (a) Total taxes (TT) are the sum of corporate income tax + labor taxes + other taxes; (b) Total tax rate (TTR) = TT/private enterprises’ net and taxable income, in percent (see table). Source: Price Waterhouse Coopers (PWC), Paying Taxes annual reports 2009, 2012, 2015, 2017. Based on these numbers, we both have good and bad news. The good news is that the Philippines has a declining TTR, from almost 51% in the 2009 PWC report to nearly 43% in the 2017 report. Other economies with declining TTR are Brunei, Singapore, Laos, Indonesia, Myanmar, Taiwan and Japan. 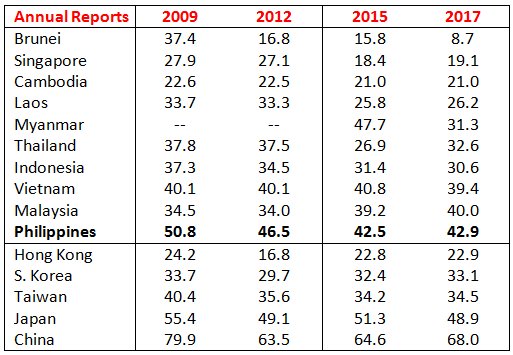 Only Malaysia has a deteriorating or rising TTR. The bad news is that the Philippines has the highest TTR in the 10-country ASEAN, higher than socialist Vietnam, also higher than developed Hong Kong, South Korea, and Taiwan. 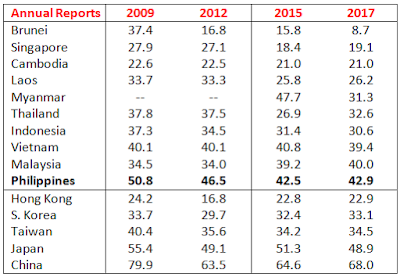 Only welfarist Japan and socialist China have TTRs higher than the Philippines. These are the more controversial aspects of Dutertenomics’ TRAIN -- (a) hike in excise tax for oil products and new cars, (b) introduction of additional tax on sugar-sweetened beverages, and (c) expansion of VAT coverage to more sectors including business process outsourcing (BPO). To help dispel the ugly label of “Philippines having the highest TTR in the ASEAN and other East Asian economies,” tax proposals (a) and (b) should have been abandoned, and 12% VAT (highest in the ASEAN) should be reduced to only 6%, probably even 8% and cover more sectors including BPO. The main reason why many sectors lobbied for exemption from VAT is because 12% is high. To help fund Dutertenomics’ build-build-build plan without those new taxes and tax hikes, the government should cut spending on some agencies and bureaucracies whose welfarist goals and mandates overlap with other agencies. Then rechannel the savings to more infrastructure spending. But this is now wishful thinking as the TRAIN is on a fast track of legislative wreckage. SFL-PH President Joseph T. Bautista has invited me to be one of the speakers on Day 2 of the event and I gladly accepted the honor. SFL CEO Wolf von Laer will give the keynote address. Other speakers will be Thomas Laughlin, CEO of Amagi; Luis Sia, president of UpStart; Shahab Shabibi, CEO of World by Machine Ventures; Mahar Mangahas, president of Social Weather Stations (SWS); Imantaka Nugraha of SFL-Indonesia, and Markus Löning of Friedrich Naumann Foundation for Freedom (FNF). I will talk about state coercion and legislations in the energy sector, infrastructure, and fiscal policies during the SFL conference. Bienvenido S. Oplas, Jr. is the head of Minimal Government Thinkers and a SEANET Fellow. Both are members of Economic Freedom Network (EFN) Asia. All government agencies, departments and bureaus, officials and their consultants, are tax-hungry. Health and housing sectors say "we need more money." 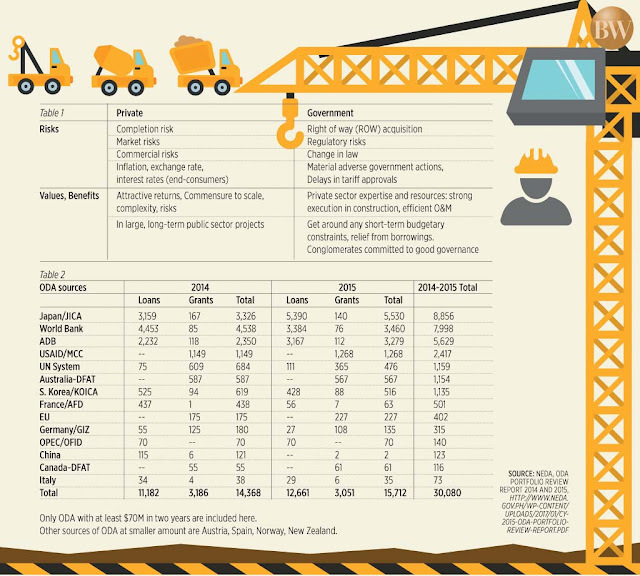 Infra and agri sectors say "we need more money." LGUs and Police say "we need more money." Military and defense say "we need more money." Basic and tertiary education (DepEd, CHED, SUCs) say "we need more money" and "Free tuition for all students in public schools and universities." Almost all of them are silent or explicit campaigners of tax-tax-tax pa more. There are dozens of alibi to justify tax greediness. Those who argue "Rechannel ______ (agency) budget to education" are daydreaming. All agencies have their own justifications and alibi that they need more money, so there is no way to significantly cut their budget and rechannel the money to free tuition for all SUCs. Many NGOs have become government-funded orgs (GFOs). You see them among the campaigners, silent or vocal, of tax-tax-tax pa more. This is a losing proposition now but I will say it nonetheless: NO to new or higher taxes, there are lots of existing ones already. NO to new expensive subsidies like this free tuition for all students (currently part-subsidies depending on family income of students) in SUCs. If one sees the cars in UP and many other SUCs, one will wonder why these students are getting subsidies. 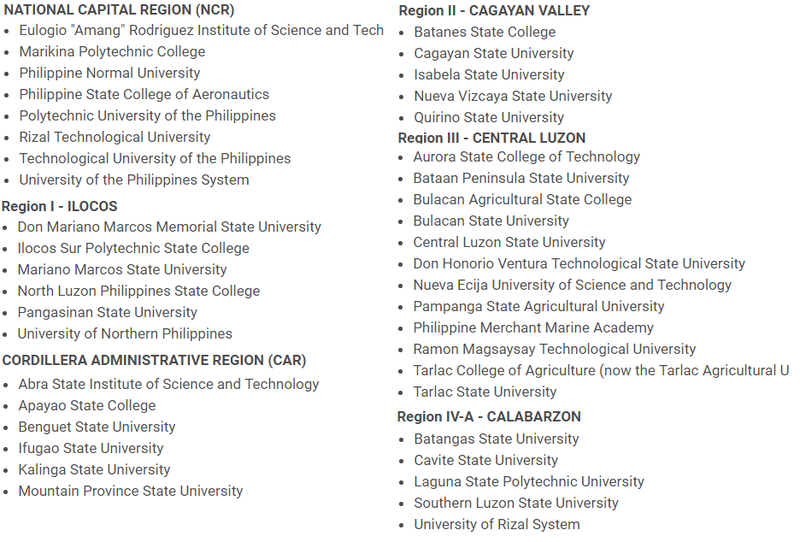 DBM's Sec. Diokno said this welfarist program alone will cost P100B/year. Among the big casualties of free-free-free, or subsidize-subsidize-subsidize philosophy is the corruption of people's values. Less personal and parental responsibility, more state responsibility. So more parents will be doing pa-inom-inom, pa sugal-sugal, etc. Their children's education from elementary to university is no longer parental responsibility, state responsibility na. Healthcare, state responsibility too. The number of free riders, irresponsible people and tax-hungry bureaucrats and consultants will increase. For any problem, their "solution" is more government. Then people complain of massive wastes, inefficiencies, robbery and plunder in government. As government expands, stupidity and irrationality expands. "A government that's big enough to give you everything you want is also big enough to take everything you've got." * This is my article in BusinessWorld on July 12, 2017. Cheaper and stable energy means cheaper production costs for the industrial, agricultural, and services sectors of the economy. Cheaper energy also results in increased convenience for consumers too as many activities now are impossible without stable electricity supply. In the modern history of Asian economies’ rapid growth, the use of coal power is an important contributor for their economic expansion. (1) Countries that have high and fast coal consumption are also those that experienced faster economic expansion (at least three times expansion of GDP size). Most especially China, India, South Korea, Indonesia, Vietnam, Malaysia, and Philippines. 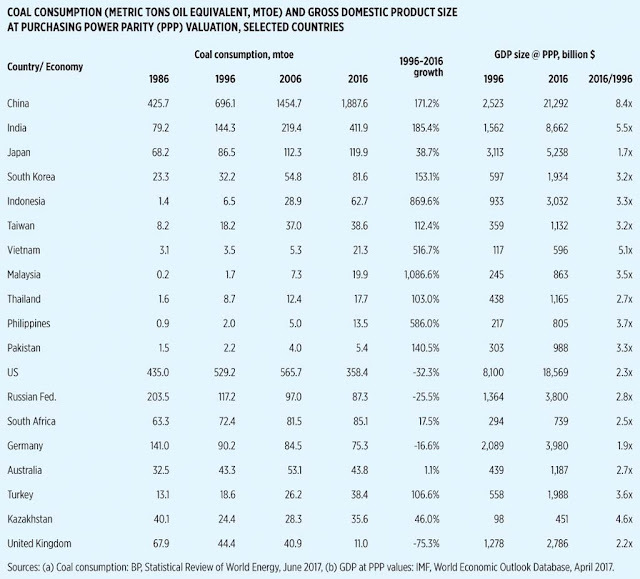 (2) Countries with declining coal use are also those with slow economic expansion (below three times expansion of GDP size). Most notable are the US, Russia, Germany, and UK. (3) Philippines’ coal use is actually small compared to its neighbors; its 2016 use is just nearly 1/2 of Malaysia and Vietnam’s consumption, just 1/3 of Taiwan’s and almost 1/5 of Indonesia’s. South Korea, Japan, India, and China’s consumption are many times bigger than the Philippines’. Recently, groups have suddenly scored seven coal power plants that entered into power supply agreements (PSA) with Meralco last year. These coal projects are (1) Atimonan One Energy (A1E) 1,200 MW, (2) Global Luzon (GLEDC) 600 MW, (3) Central Luzon Premiere (CLPPC) 528 MW, (4) Mariveles Power (MPGC) 528 MW, (5) St. Raphael Power (SRPGC) 400 MW, (6) Redondo Peninsula (RPE) 225 MW, and (7) Panay Energy (PEDC) 70 MW. This covers a total of 3,550 MW of stable and affordable energy that can lead to cheaper and reliable electricity supply for more than 20 million people in Metro Manila, Bulacan, Rizal, Cavite, Laguna, and parts of Batangas and Quezon provinces. These groups -- Center for Energy, Ecology, and Development (CEED), Philippine Movement for Climate Justice (PMCJ), Sanlakas, Freedom from Debt Coalition (FDC), Koalisyong Pabahay ng Pilipinas (KPP), Power for People (P4P) member organizations, others -- argue that coal plants are detrimental for the people’s health and livelihood as well as bad for the environment. 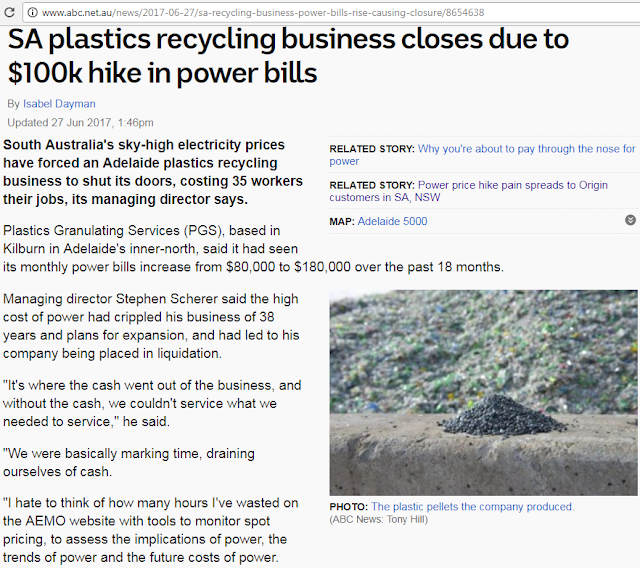 What is bad for the people’s health and livelihood are more candles and noisy gensets running on diesel when there are frequent brownouts coming from intermittent, unreliable renewables like solar and wind. Candles are among the major causes of fires in houses and communities. What is bad for people’s health and security are dark streets at night that contribute to more road accidents, more street robberies, abduction and rapes, murders and other crimes. Many LGUs reduce costs of street lighting when electricity prices are high (ever-rising feed-in-tariff or FiT for renewables, more expensive oil peaking plants are used during peak hours, etc.). 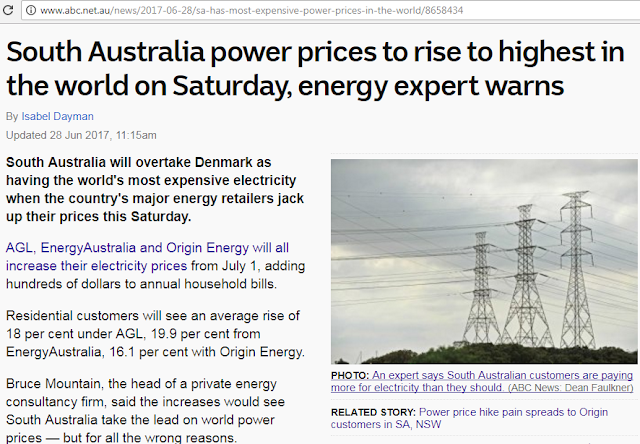 Expensive and unstable electricity can kill people today, not 100 years from now. Seeking to disenfranchise some 3,550 MW of stable and cheaper energy supply from seven coal plants is suspicious. There are no big hydro, geothermal, and biomass plants coming in. Wind and solar are limited by their intermittent nature, have low capacity factors, high capital expenditures, and often are located far away from the main grid. The only beneficiaries of disenfranchising big capacity coal plants then would be the owners of new natural gas plants. 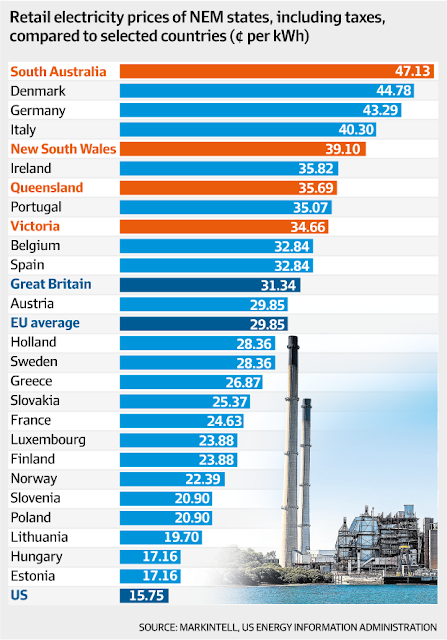 Are natural gas cheaper than coal power? From the recent experience of Mindanao where many big coal plants were commissioned almost simultaneously, the answer seems to be No. The generation price in Mindanao has gone down to below P3/kWh, on certain days even below P2.50/kWh. 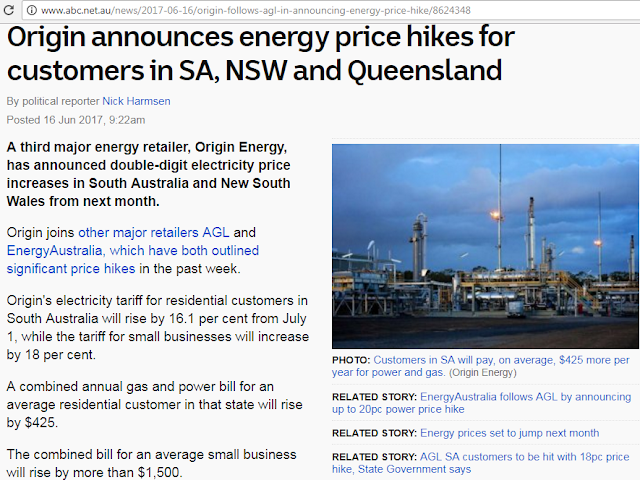 Which means coal power has big leeway for lower price if competition becomes tighter. This cannot be said of natural gas plants here. Consumer groups and NGOs should bat for cheaper, stable electricity. If they fight for something else like intermittent and expensive renewables, or more expensive gas plants, then they abdicate their role as representatives of consumer interests. Pathetic. Bienvenido S. Oplas, Jr. is the head of Minimal Government Thinkers and a Fellow of SEANET, both are members of Economic Freedom Network (EFN) Asia. I see lots of negative stories and reports about the US government and US leadership, for weeks and months. But business confidence, especially the US stock markets show positive stories, all-time high. Where is the big disconnect coming from? In this chart, data as of yesterday, US' DJIA vs Germany's DAX, last 3 months. I check the headlines of BBC, CNN, NYT, etc., they hardly report this good news. High growth in the stock market means high confidence in most companies listed there, which can be a proxy for high confidence in the overall economic and business environment. I think many businessmen/women both in the US and abroad are clapping Mr. Trump's business policies, especially in energy. The US has over-taken Saudi as the #1 oil producer. It has overtaken Russia as #1 gas producer. The next question is if the US will become a #1 oil and gas exporter. 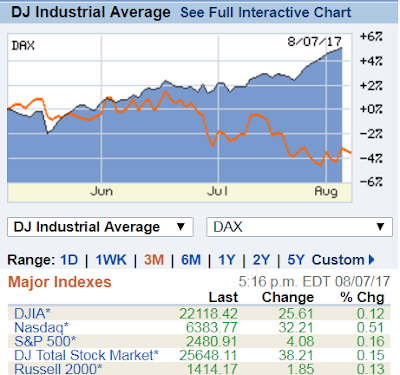 I remember when DJ reached 20,000 few months ago, many anti-T guys were predicting a "crash very soon". Now I think they will predict another round of "crash very soon." But that`s not what US innovation and companies are headed to. They are generally going up. * This is my article in BusinessWorld on June 30, 2017. This is a continuation of two earlier pieces I wrote about that compared two funding schemes of government infrastructure projects in the Philippines -- through public-private partnership and official development assistance. Recently, Dr. Bong Montes sent me his presentation during a Management Association of the Philippines (MAP) meeting. The correct numbers about SCTEx are: Cost overruns are from P18.7B to P32.8B; Cost per kilometer is P349M vs. TPLEx P274M. Thanks for this, Bong. The same presentation indicated a summary of the delineation of risks and values between Public Private Partnership (PPP) funding and government funding (see Table 1). The main beef of PPP project funding therefore is the transfer of significant risks to the private sector. The shared risks for both private and government are bankability and force majeure. The “hybrid PPP” plan of Dutertenomics is to award the construction of many big infrastructure projects via foreign aid or Official Development Assistance (ODA) mostly from China, or the annual General Appropriations Act (GAA), then invite local private operators later for the operation and maintenance (O&M). This plan will invite big current and future controversies for the following reasons. One, private O&M operators will not take over a facility that they did not design and construct without prior intensive due diligence. If project quality is poor and thus O&M will be high, then bidders will demand high prices for the O&M. The government-contracted construction company (from China) may have undercut the design and quality to maximize profit and potential kickbacks and leave the headache of high maintenance costs to the separate O&M operator/s. The most optimal scheme is a straight, integrated PPP funding from design and construction to O&M. The private party mobilizes its internal financial muscle and borrows to fund capex, and make sure that construction is of high quality so that O&M will be lower. As a result, the public and the taxpayers benefit, which also means a lower tax burden to pay for the project cost. Moreover, frequent users of the facility will pay every time they use it and taxpayers from far away provinces and regions who seldom or do not even benefit from it will not be burdened. Two, Dutertenomics’ sudden pivot to China ODA is highly anomalous because China is not exactly a good source of foreign aid even in the recent past. Its share in total ODA in 2014 and 2015 (latest data available from NEDA) is miniscule, only $123M out of total $30.08 billion (see Table 2). Only ODA with at least $70M in two years are included here. Other sources of ODA at smaller amount are Austria, Spain, Norway, New Zealand. Three, PPP projects are generally the fastest way to do things compared to ODA funding, especially China ODA. Project development to groundbreaking takes 27 months through the PPP, 37 months through Korean ODA, 38 months through Japanese government funding, and 40 months on Chinese aid. The most famous tollway in the Philippines, the North Luzon Expressway (NLEx) was built via World Bank ODA in the 1970s. O&M is private, currently the Manila North Tollways Corp. (MNTC). The independent design checker and certification engineer on its rehabilitation is Norconsult Philippines, probably the first Norwegian company to do business in the country since the ’70s. NLEx toll fee of around P2.50/kilometer from Sta. Ines to Balintawak is the lowest among the many tollways in the country.